NAMM 2018: Samson’s new Expedition XP108w PA is not only portable, but it’s also rechargeable. It can run for up to 20 hours on a single charge and boasts Bluetooth audio capabilities. The XP108w features a 4-channel mixer with 2-band master EQ and volume controls on each channel. 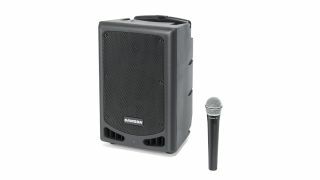 It ships with a wireless microphone, while a line output enables you to daisy-chain multiple systems for a bigger sound. That said, you get 200 watts of power from a single unit, which weighs a shade under 24 pounds. Detailed specs are below, and you can find out more on the Samson website. The Expedition XP108w will be released in March priced at $400.